LRWC’s concerns about violations of human rights associated with activities of Canadian corporations outside Canada as well as LRWC’s recommendations. The Working Group’s webpage does not indicate Canadian civil society advocacy on a National Action Plan to implement the UN Guiding Principles on Business and Human Rights (Guiding Principles), however, there has been considerable advocacy seeking Canadian protection of human rights on issues related to activities of business enterprises. When Canada removed its objections to the UN Declaration on the Rights of Indigenous Peoples (UNDRIP or Declaration on 10 May 2016, Minister of Indigenous Affairs Carolyn Bennett told the UN, “We are now a full supporter of the declaration, without qualification.” Despite its pledge to fully adopt the Declaration, Canada has allowed significant violations of its free, prior and informed consent (FPIC) provisions to give priority to the interests and demands of private corporate interests seeking private profit (business interests). Examples include federal approvals of the Kinder Morgan Trans Mountain Pipeline, The Enbridge Northern Gateway Pipeline, and the BC Hydro Site C dam project. The BC and Canadian governments’ approvals of the Site C dam have authorized irremediable environmental, social, cultural and economic damage, loss of traditional territories of Dane-zaa, Cree, Métis and other Treaty 8 nations, and the violation or extinction of treaty rights to continued occupation and use guaranteed by Canada’s Constitution. Construction of the dam also violates rights of the general public to meaningfully take part in the conduct of public affairs and to protection of continued public use of and access to land, air and water. An additional concern has been Canada’s lack of a safe and enabling environment for civil society. While some serious concerns about government constraints on civil society have abated since the election of a new federal government in late 2015, the current Canadian government has failed to repeal or amend “Bill C-51,” The Anti-terrorism Act despite massive expression of public and civil society concern that a number of its provisions are vague and overbroad. 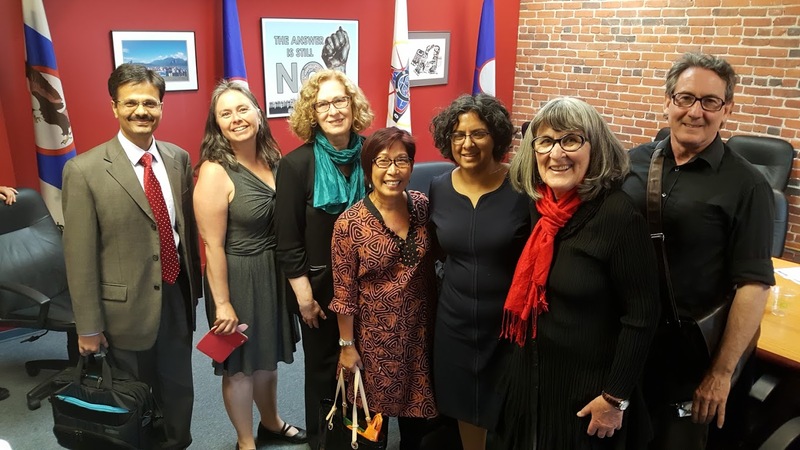 Bill C51poses risks of criminalizing democratic dissent and legitimate activities of environmental activists and human rights defenders, including Indigenous land rights activists peacefully defending their lands against corporate intrusion without free prior and informed consent (FPIC). Numerous experts have shown how vague and overbroad language of Bill C-51 could also be abused to violate rights to freedoms of expression, association, peaceful assembly and the right to privacy. Canada’s failure to protect Indigenous People’s rights and human rights that would restrict activities of powerful corporate and political actors stems from its failure to correct shortcomings inherent in the colonial processes through which the modern State took shape. The Dominion of Canada was founded in 1867 as a federal colony by an act of Britain’s parliament in which neither settlers nor the Indigenous peoples had elected representation. The express purpose of the British North America Act was “to promote the interests of the British Empire.” A judicial system and both federal and provincial legislatures were established for the participating settler colonies; however, Indigenous peoples were neither informed nor represented in the proceedings leading up to the confederation of Britain’s North American colonies. Britain delegated authority to negotiate with “Indians” to the federal level of Canada’s government, and some treaties were negotiated to permit the extension of British imperial settlement; however, Indigenous peoples were not informed of significant decisions affecting their rights. Canada interpreted the powers delegated by Britain as authority to unilaterally determine the meaning of treaties and to make laws for “Indians” despite their lack of representation in any Canadian legislature. Without access to impartial adjudication, Indigenous peoples were subjected to genocidal policies in the name of “nation building.” When they attempted to find a tribunal where they could defend their rights, Canada revised the Indian Act to prevent Indigenous peoples from hiring lawyers. In short, Canadian dominion was extended in flagrant violation of the Indigenous right not to be absorbed by another state, which rights are affirmed by the Western Sahara case in 1975 and reiterated by the United Nations Declaration on the Rights of Indigenous Peoples (UNDRIP). Although some offensive provisions in Canadian law have been repealed, Canada continues to mediate the rights of Indigenous peoples through representatives defined by the Indian Act despite the fact that it was instituted in colonial circumstances that have been thoroughly rejected by the community of nations and by the values to which Canada is now constitutionally bound. Modern technological developments have made environmental destruction possible on a scale unimaginable at the time when treaties and agreements were made. Despite this radical change in circumstances. Canada continues to treat Indigenous lands and resources as commodities owned by the Crown and available for commercial use rather than as community assets that must be managed for the wellbeing of current and future generations. Because of this failure to adapt to modern circumstances, the rights of Indigenous peoples to continued use and occupation of lands, and even rights to use and occupation recognized by treaties and decisions of Canadian courts, are effectively been extinguished by government-sanctioned corporate activities. These activities most often involve enterprises that are hugely profitable for the corporate actors and devastatingly costly for the public including Indigenous peoples. Construction of hydroelectric dams and resource extraction and transport projects are two such enterprises that preclude continued occupation and safe use. Enforced displacement and catastrophic and sometimes irremediable environmental, social and cultural damage are caused. Damages include contamination of water; usurpation of agricultural land; reduction, displacement and extinction of aquatic, air and land-based wildlife; and, destruction of social and cultural communities. Canada does not conduct meaningful consultations with Indigenous peoples whose rights to lands, occupation and use are threatened, although this is required by UNDRIP, prior to authorization of such projects. Canada and Canadian courts view the right to consult as limited to informing Indigenous peoples about the planned project and inviting comments on the proposed damage remediation plans. Canada and Canadian courts do not recognize the right to FPIC including the right to say no. Similarly, Canada is failing to allow and enable participation in decision-making about large projects involving issues affecting general public interests as well as specific interests of Indigenous peoples. The power of elected representatives to hold the government to account, provide meaningful input from constituents and affect decision-making has been displaced, by central control by the prime minister, or premiers, party leaders and non-elected advisors and lobbyists. Communications from individuals, groups and specialists not part of the central decision-making group seem futile. Applications for judicial review of decisions by the Governor General in Council are not a viable option because of costs. The failure to ensure the equal right to participate directly or indirectly in political and public affairs guaranteed by the International Covenant on Civil and Political Rights (ICCPR), article 25, potentially impairs connected rights to peaceful assembly and association, freedom of expression and opinion and the rights to education and to information. [i]ncreasingly, international human rights mechanisms are acknowledging the rights of all people to be fully involved in and to effectively influence public decision-making processes that affect them. These public participation rights encompass the rights to be consulted at each phase of legislative drafting and policymaking, to voice criticism and to submit proposals aimed at improving the functioning and inclusivity of all governmental bodies engaged in the conduct of public affairs. This wider interpretation of the right to political and public participation is particularly apparent in relation to the rights of persons with disabilities and in connection with indigenous peoples, minorities and the role of civil society organizations. In BC, there is no human rights commission that satisfies the Paris Principles for National Human Rights Institutions (NHRI). The BC Human Rights Tribunal has no jurisdiction to “promote and ensure the harmonization of national legislation, regulations and practices with the international human rights instruments to which the State is a party, and their effective implementation,” as required by the Paris Principles. Also, the BC Human Rights Tribunal cannot adjudicate cases beyond a very narrow range of provincial definitions of discrimination and has no jurisdiction to hear complaints involving violation of rights protected by international law. Thus, for violations of internationally protected rights committed by business enterprises, there may be little or no access to remedies. Canada’s constitutional structure gives the federal government limited jurisdiction regarding human rights protection in cases involving business activities. The Provinces have jurisdiction over many of the relevant matters, creating a patchwork of provincial laws to regulate business activities. Human rights treaty bodies and non-governmental organizations have criticized Canada for its failure to have an effective implementation mechanism and for ignoring recommendations that have been made repeatedly to Canada. Canada has not ensured coordinated implementation of international human rights obligations by passing the necessary federal laws and negotiating with provinces to make laws to implement Canada’s international human rights obligations including full human rights protection to those affected by business activities. This, coupled with relaxed environmental protection, inadequate environmental assessment favouring profit and centralized, behind-the-scenes decision making, has left the public and Indigenous peoples with little means of participation other than protest to voice dissent. Develop an NAP intended for implementation throughout all levels of government in Canada, working in cooperation with federal, provincial and territorial governments and Indigenous peoples, and in full consultation with municipal governments, businesses and civil society. Actively support, encourage and train business enterprises to incorporate the Guiding Principles throughout their policies and plans. Ensure that all approval processes for business activities and projects require clear evidence of effective plans and measures for protection, respect and remedies pursuant to the Guiding Principles, as well as adherence to all of Canada’s human rights obligations. The Working Group in its 2012 Annual Report indicated its intention to encourage development of national plans of action to implement the Guiding Principles on Business and Human Rights (Guiding Principles). In 2012, the UK and the Netherlands had already launched National Action Plans (NAP) to implement the Guiding Principles, and several other States were developing them. Canada was not among them. Now, in 2017, fourteen States have published NAPs and another 22 have either commenced or committed to developing NAPs. While Canada indicates support for the Guiding Principles, to our knowledge it not made a commitment to develop a NAP. Canada’s progress in meaningful implementation of the Guiding Principles has been sluggish. This presents a serious challenge internationally given that Canadian extractive companies have such a large presence around the world and are reportedly implicated directly or indirectly in many conflicts with Indigenous peoples and other local people over environmental, land and water issues and associated human rights violations. In 2009, the Canadian Mining Association indicated that 75 percent of the world’s mining companies are registered in Canada, operating in 10,000 projects in more than 100 countries. Canada’s current efforts are focussed on voluntary measures including the Organisation for Economic Co-operation and Development (OECD) Guidelines for Multinational Enterprises which have incorporated the Guiding Principles since 2011. In accordance with the OECD Guidelines, Canada has an inter-departmental National Contact Point (NCP) chaired by the Ministry of Global Affairs. The NCP offers a complaint resolution process through dialogue and facilitation. Global Affairs Canada’s public document online indicates that if Canadian companies do not participate in NCP dispute resolution processes or fail to engage in good faith, the consequences will be withdrawal of Government of Canada trade advocacy abroad and unfavourable consideration regarding availability of support through Canada’s financing crown corporation, Export Development Canada. LRWC does not know whether such consequences have ever been invoked or what would be the standards for measuring a Canadian corporation’s failure to “engage in good faith.” The Canadian public does not widely know about the existence of the NCP’s dispute resolution process. The NCP 2015 annual report (the last report publicly available online) acknowledges “[d]ifficulties in engaging the business community, worker organizations, other non-governmental organizations, other interested parties” and suggests more inter-departmental coordination and more resources to ensure that along with their complaint resolution work, they can undertake promotional efforts. Some organizations have proposed a step forward towards an ombudsman. An ombudsman that reports to Parliament with adequate powers of investigation, recommendation and public reporting, and fully compliant with the Paris Principles on NHRIs, may be a step forward. However, LRWC believes that Canada’s non-binding advisory and conciliation approaches have failed to demonstrate effectiveness in preventing or stopping Canadian corporations working overseas from circumventing obligations to respect internationally protected human rights and remedy violations as articulated in the Guiding Principles. Without Canadian laws with teeth, we will continue to see reports that Canadian corporations are implicated in human rights violations in other countries where they operate. LRWC recognizes the challenge, because corporations and business enterprises, particularly extractive industries, insist that the norms remain voluntary. In 2009 and 2010, extractive companies expended significant resources and energy to prevent the passage of binding legislation for accountability of Canadian corporations working overseas. Bill C-300, The Corporate Accountability of Mining, Oil and Gas Corporations in Developing Countries Act, was defeated in 2010. Bill C-300 sought to provide a mechanism for the government to hear complaints and withhold financial and political support from companies failing to adhere to Canadian and international environmental and human rights standards. Although Bill C-300 was not strong, it was vigorously opposed by the mining lobby and was narrowly defeated (140 to 134, with the opposition Liberal leader and other Liberal Members of Parliament (MP) ensuring its defeat through their noticeably absence from the vote). The MP championing Bill C-300 has since called for an Ombudsman, saying that Canadian extractive industries have nothing to fear from an Ombudsman because of their improved performance. LRWC is not convinced of the value of another non-binding mechanism. Canadian corporations continue to be accused of complicity with serious human rights abuses in States where deep-rooted patterns of impunity protect powerful individuals and businesses from accountability for attacks and murders of human rights defenders. Victims have included land and environmental activists, lawyers and journalists in a number of countries. LRWC has advocated in cases of attacks and murders of human rights defenders where business interests are implicated, including cases involving Canadian corporations. Two examples are cases in Guatemala and Honduras. Victims of abuses find themselves without remedies either in their home states where the rule of law is weak, or in states where corporations (or parent corporations) are registered. In Garcia v Tahoe Resources Inc., Guatemalan nationals have brought a lawsuit against a Canadian corporation in the Supreme Court of British Columbia based on allegations that Tahoe (the parent company of a mining company in Guatemala) is responsible for damages suffered when the plaintiffs were shot during a protest outside the gates to Escobal mine in Guatemala. The plaintiffs allege that Tahoe (the parent company of Escobal’s Guatemalan owner) “expressly or implicitly authorized the use of excessive force…or was negligent in failing to prevent…security personnel from using excessive force.” In a precedent setting decision on 26 January 2017, the BC Court of Appeal overturned a BC Supreme Court ruling that Guatemala was the appropriate forum to determine the plaintiffs’ claims. The BCCA concluded there was, “some measurable risk that the appellants will encounter difficulty in receiving a fair trial against a powerful international company whose mining interests in Guatemala align with the political interests of the Guatemalan state.” On November 2016 Jeremy Barrios, assistant to the Executive Director of CALAS, one of the groups supporting the BC plaintiffs, was assassinated. Prior to his murder Jeremy Barrios was managing sensitive information in cases brought before courts by CALAS. With no legislative support such litigants face a costly and uncertain uphill battle to hold Canadian corporations accountable and achieve a remedy. In Honduras, Canada has deep engagement in encouraging Canadian mining in the context of widespread impunity for murders of human rights defenders, particularly Indigenous defenders peacefully protesting land and environmental rights violations by extractive industries. In this context, Canada’s government has failed to take firm measures to hold Canadian corporations to account for their alleged human rights violations. On the contrary – Canada provided technical assistance to a new mining code passed in 2013 which favours companies while providing little protection for people and the environment. impose a duty on public officials to preserve records of decision making. Implement the Guiding Principles in accordance with the recommendations in Part 1 above, including incorporation of protection of human rights defenders, e.g. using the Model Law for the Recognition and Protection of Human Rights Defenders. UNDRIP, Articles 25, 26, 28, 29, 31, 32. LRWC, Restoring the Space for Dissent in Canada. Written statement to the 26th session of the UN Human Rights Council, 25 May 2014, available at http://www.lrwc.org/ws/wp-content/uploads/2014/05/Online-Copy-Canada.Shrinking-Space-for-Dissent.LRWC_.25.May_.2014.pdf. This report documented concerns about: Government surveillance of Indigenous organizations, environmental groups and human rights defenders engaged in lawful activities; seemingly discriminatory targeted defunding of international development organizations, Indigenous groups, women’s equality and pay equity groups, and social justice groups; public vilification of environmental groups and human rights defenders; targeted audits of civil society groups for Canada Revenue Agency audits and warnings, apparently aimed at curtailing “political” activity of international development organizations, environmental organizations and human rights organizations and religious organizations whose statements or actions were viewed as inconsistent with views of the government at that time. British North America Act, 1867, 30-31 Vict.c.3 (U.K.) (BNA Act) A “Dominion” was legally defined as a colony. The Earl of Halsbury, The Laws of England, London, Butterworth, 1909 vol. X, 859. BNA Act, 1867, preamble and s. 132. The purpose of Canada was not revised in 1982 when the act was renamed by the Constitution Act, 1982, s.53 (2) to become the Constitution Act, 1867. Darlene, Johnston, The Taking of Indian Lands in Canada: Consent or Coercion? (University of Saskatchewan, Native Law Centre, 1989). BNA Act, s. 91(24); Alexander Morris, The Treaties of Canada with the Indians of Manitoba and the North-West Territories (Toronto : Belfords, Clarke and Co., 1880). Significant post-confederation developments concerning Indigenous rights include the “sale” of the Hudson’s Bay Company trading territory to Canada, Rupert’s Land Act, 1868, 31-32 Vict., c. 105 (U.K.) and the transfer of natural resources from federal to provincial jurisdictions by the Constitution Act, 1930, 20-21 George V, c. 26 (U.K.) which instituted Natural Resource Transfer Agreements. See e.g., Indian Act, 1876, S.C. 1876, c.18 (39 Vict.) s.12 and subsequent revisions. John A. MacDonald, the first Prime Minister, instituted a policy of starvation to make way for railways and settlement. James, Daschuck, Clearing the Plains, University of Regina Press, 2013. Children were forcibly taken from their parents to prevent the transmission of cultural knowledge. Sinclair, Justice Murray (Mizana Gheezhik) Chair, Dr. Marie Wilson, Chief Wilton Littlechild, The Final Report of the Truth and Reconciliation Commission of Canada, Volume 1, “Canada’s Residential Schools: The History, Part 1 Origins to 1939”, Introduction, McGill-Queen’s University Press, 2015. http://nctr.ca/reports.php. Indian Act R.S.C. 1927. C.98 s.141. This was enacted shortly after the Haudenosaunee Six Nations applied for membership in the League of Nations. See e.g. Grace Li Xiu, Woo” Canada’s Forgotten Founders: The Modern Significance of the Haudenosaunee (Iroquois) Application for Membership in the League of Nations” (2003) 1 LGD (Journal of Law Social Justice and Global Development) http://elj.warwick.ac.uk/global/issue/2003-1. Western Sahara, I.C.J., 16 October, 1975, para. 57 at 12. See e.g. ss. 15 and 35 of the Constitution Act, 1982 enacted by the Canada Act, 1982 (U.K.) 1982 c.11, Sched. B.
 HR Committee, CCPR General Comment No. 25 Article 25 (Participation in Public Affairs and the Right to Vote), 12 July 1996, CCPR/C/21/Rev.1/Add.7, para. 26. UN, HRC, Report of the United Nations High Commissioner for Human Rights on factors that impede equal political participation and steps to overcome those challenges, A/HRC/27/29 (30 June 2014), para. 21. For a brief overview of Canada’s framework for implementation of human rights treaties, see Catherine Morris, Implementation of Human Rights Treaties in Canada. Briefing Note, 1 March 2014, available at http://www.lrwc.org/implementation-of-human-rights-treaties-in-canada-briefing-note/. Canada is a dualist state requiring passage of legislation to implement international treaties. Canada has a federal-provincial Continuing Committee of Officials on Human Rights (CCOHR) meets in person twice a year and engages in monthly telephone conference calls to consult and share information on international human rights instruments. Online: CCOHR <http://www.pch.gc.ca/pgm/pdp-hrp/canada/cmtt-eng.cfm>. However, the CCOHR is not an implementation body; the mid-level officials participating in the CCOHR have little or no decision making power, and the CCOHR has limited financial resources and no accountability to elected legislative assemblies or Parliament. No political level meeting of federal, provincial and territorial ministers responsible for human rights has occurred since 1988. Peter Mazereeuw, “Liberals ‘seriously’ considering mining ombudsperson, says federal corporate social responsibility adviser,” Hill Times, 9 November 2016, Available at https://www.hilltimes.com/2016/11/09/feds-seriously-considering-mining-ombudsman-says-canadas-corporate-social-responsibility-envoy/86691. International Service for Human Rights, Model Law for the Recognition and Protection of Human Rights Defenders, Geneva: ISHR, 2016, available at: https://www.ishr.ch/sites/default/files/documents/model_law_full_digital_updated_15june2016.pdf. The development of the Model Law as facilitated by the International Service for Human Rights in consultation with more than 500 human rights defenders from every region and adopted by 28 leading human rights experts and jurists.